We here at ECAB are well aware that Mardi Gras was weeks ago. We are aware that we are nearly halfway through Lent (although we are an equal-opportunity frivolous blog). This is still a great dessert, and someone gets to wear a crown. 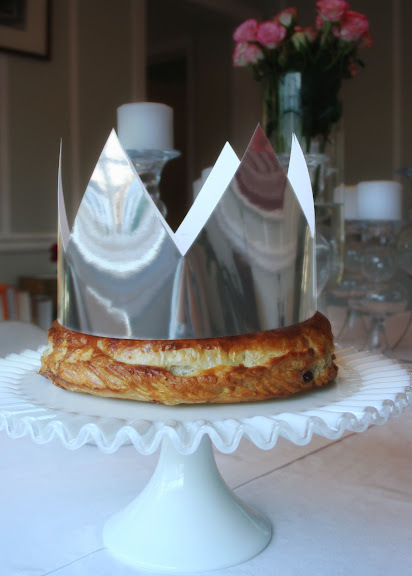 A crown is presented along with the galette (mine is made from shiny cardstock, but they're also available online). While someone slices and distributes the galette, the youngest person present sits under the table and calls out the name of the person to receive the next piece. This ensures objectivity, as sometimes, as at our Mardi Gras dinner, one of the baby's little legs is clearly hanging out the side of a slice. The person who receives the baby (or, more lamely, the bean) does not wear the crown herself. Instead, she picks her king (or queen, as the case may be), and crowns that person. Quel magnanimité! Everyone drinks! Place the second circle of dough on top of the first, and very lightly press the edges together. Sike! Only lightly press the edges together if you want the almond cream, all hot and bothered, to abandon the galette completely and head for nicer climes at the bottom of your oven. That may, indeed, be what you want. The acrid smell of charred pastry cream may be just the thing to help you unwind after a long day of shopping for plastic babies. If not, follow these instructions instead. *Making your own puff pastry is kind of a pain, but for a recipe like this, where the pastry is really the star, it might be worth it. Since the DeKalb Farmer's Market near me sells fresh, high-quality puff pastry, I generally just use that. Margarine is just not a substitute for the magic that is butter. But if you're short on time, and you don't have a market or bakery that sells the all-butter stuff, Pepperidge Farm will do just fine. Decide how big you want your cake. Unlike most cakes, where you expect to have leftovers, the galette des rois should be finished in one sitting, so that someone is sure to be crowned king. A 9" cake, for which this recipe is sized, will serve about 8 people. An 8" cake will serve 6. Roll out your puff pastry on a floured surface. Using a plate or a cake circle as a template, cut out two circles of dough 1" bigger than your finished cake size. Use a pastry brush to brush off excess flour. Place one dough circle on a parchment-covered rimmed baking sheet. Mix together one cup pastry cream, one cup almond cream, and rum. If you're making an 8" or 6" cake, you can use a little less of each. Mound the cream mixture in the middle of the dough circle, leaving a 1" to 1 1/2" border all the way around. Press the baby into the cream, away from the center of the circle. In a small bowl, microwave the jam for 15 seconds, and stir until it is smooth. Use a spoon or Ziploc or piping bag to drip the jam over the cream mixture; it won't completely cover the cream. In a small bowl, gently beat the egg. Brush egg around the edge of the first pastry circle. Place the second dough circle over the mound of cream. Because it is mounded, the top circle won't quite reach the edges of the bottom circle. Fold the edge of the bottom circle up over the edge of the top circle; press in place firmly, and crimp with a fork. Then turn up the crimped edge 90 degrees, and press against the side of the galette. Use the edge of a knife to seal the sides with little diagonal indentations (don't cut through the dough). Beat a splash of cream into your egg wash, and brush liberally over the entire galette. Cut a steam vent in the middle of the dough, and cut very shallow decorative lines into the top of the cake, cutting only through the first quarter or so of the dough. Place the assembled galette in the refrigerator for 30 minutes. Meanwhile, preheat the oven to 400 degrees. Bake for 40 minutes, rotating and brushing with another coat of egg wash halfway through. Let cool completely. Serve at room temperature. This is not the recipe I normally use, but I really like it. In a medium saucepan, bring the milk and sugar to a boil. Place the egg yolks in a medium bowl. Whisking the egg yolks rapidly, slowly pour about half a cup of the hot milk mixture into the egg yolks. When this is incorporated, add the rest of the hot milk mixture in a very slow, steady stream, whisking all the time. Pour the mixture back into the saucepan, and whisk in the cornstarch. Continue to cook over medium heat, stirring constantly, until the mixture thickens and just begins to boil. Add the butter, and continue to stir until it is melted. Remove from heat, and continue stirring for one minute. Stir in the vanilla. Scrape the pastry cream into a bowl, and press plastic wrap onto the surface of the cream. Refrigerate until ready to use. Cream the butter and the sugar. Mix in the cornstarch. Mix in the ground almonds. Add the egg and vanilla extract and combine. Refrigerate until ready to use. That looks beautiful. I love your blog with all your wonderful ideas and instructions to make so many things. I too love to make food and other projects, so its really fun to see what you are doing! I read a long time after this post, because I like your blog and read it back until the beginning. I'm French, and I don't have exactly those traditions here : the thing hiden in the galette is called here a "fève". It's made usually with porcelain. You can see in google, typing "fève galette", a lot of examples. Most of the time, fèves are supposed to be collected through january, they make a collection. I've never find any baby in my galette, but maybe it's a local tradition somewhere. You are supposed to chose a king if you're a girl, or a queen if you're a boy, but I've always seen the person who win the fève having the crown. Sometimes if this person wants, he/she can give the crown to his/her queen/king. If you want to make it better, you can prepare another crown, so both have one. I hope I'm clear, I haven't got much opportunities to practise my english. I'm going to next post with a lot of pleasure !